Advances in science and technology are transforming health and medicine and giving patients more control over their own health. Opportunities for using mobile technology in healthcare have opened up due to the huge rise in smartphone and tablet users. Biosensing wearables, such as digital blood pressure monitors and glucose sensors, allow patients and providers to access to real time healthcare data and information. Shortfalls in funding and the ageing population are driving the development of these assistive technologies, which are expected to provide a powerful platform that enhances connectivity and improves data management between healthcare providers, medical device manufacturers, patients, medical and life insurers, the pharmaceutical industry and other stakeholders. Education and Training in assisted living (telehealth and telecare) – providing training and education for those associated within the industry or those who would benefit from further understanding. Our programmes will enable participants to develop full understanding of technology applications to care. Telehealth and telecare awareness study programmes will provide health and social care providers with an understanding of the benefits of technology in health and social care, as well as advance their knowledge on the implementing and evaluating of service redesigns and incorporating assisted living into care pathways. Consultancy – as market leaders in the understanding of this technology, we will advise on how assisted living equipment and technology can help change living and workplace environments to support individuals to live independently. This consultancy will enable and encourage collaborative working and joint bids for funding, create and implement policies to aid the implementation of assisted living and develop appropriate technology which meet the needs of clients. Tech research evaluations – A test or assessment centre for individual assessment - through partnership work with private and public sectors, CETEC will provide evaluation services to develop, design and test new technologies and evaluate the impact of technology on health and social care. 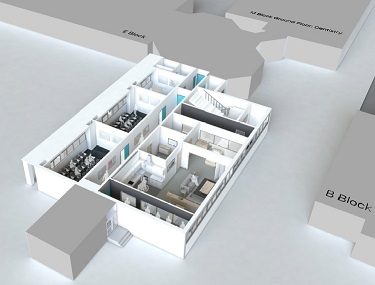 Living Lab facilities – our test bed for new products and services in assisted living will be used by technology providers and health and social care professionals as a training facility and a showcase of new technologies, providing insight into embedding assisted living into care pathways. Enterprise assisted living network - this will provide a range of opportunities for discussions between service users, clinicians, technologists, researchers and industry to debate and address key issues relating to how technology, in particular telehealth, can be used to co-design and deliver a range of remote access support systems and services with a range of longer term conditions. The CETEC team will continually develop new working practices with the help of partnership organisations, utilising lessons learned and promoting knowledge transfer through educational research programmes to support a technology enabled route, integrating it with the delivery of high-quality health and social care services. integrate technology in health and social care practice. We look forward to welcoming you into the centre and developing this project in conjunction with your needs.